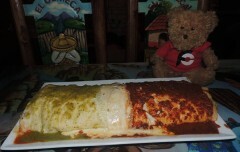 – 6 lb burrito filled with chicken, steak, rice, beans, lettuce, and sour cream. – Served wet and smothered with green and red sauces along with queso. – There is a 15 minute time limit to finish the entire burrito meal.